The combination of tang stamps and emblems can be used for dating a Wenger knife. The design of the main blade, functions, emblems and stamps all got an evolution. I believe on Wenger stamps that the placing, precision and easy identification are key factors. It is rather fascinating to look upon knives and try to find any system for them. With Wenger knives and especially from the late 1970s and up there are a few details that are extra interesting. 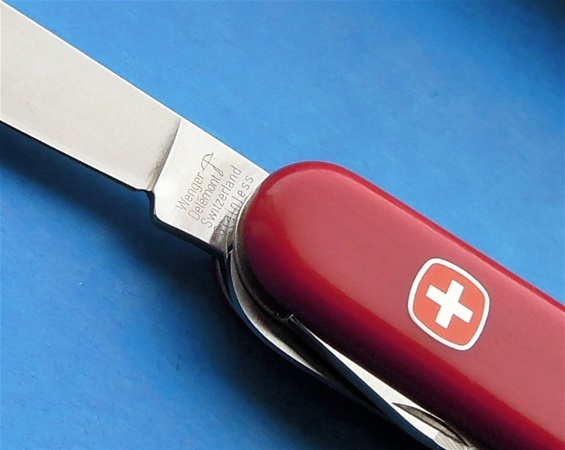 With all Swiss Army Knives you can find production variations and with Wenger you can find knives with such factors. From research it stands out all the way how important an emblem and tang stamps are for Wenger. There are small production variations on the emblem and stamps. On the pictures you can see a time window from the late 1970s until the 1990s. Only the stamp itself would be difficult to copy with success and it is for sure with Wenger that the combination emblem and stamp are related. There are variations here on purpose. The key for identification on the Wenger knives are the evolution of the design, functions and innovations. I do believe but I may be wrong that it is the same as with Victorinox about the variations from the production itself but also on purpose. If there are obvious changes then these are most likely evolution. If a stamp looks completely the same but only one is deeper than the other then it can be production variations but also on purpose and how the stampings are done or made. The evolution and design of the body of the knife may influence the position of the stamp or it can be evolution on the blades and springs that can influence the position. I am rather sure that the Wenger key is the placing, precision and how distinct the letters are. The stamp and emblem makes it very easy to identify it. It would be a nightmare to try and make a system out of the stamps and there may or not always be the case any system would exist at all. I do believe Wenger have secured their product from time to time with minor variations too. If there is a clear evolution it is many other factors involved. It would be only speculation to be sure. I do see on knives that production variations could sometimes be done on purpose. I am not sure if Wenger have had the same problem with fakes like Victorinox have. In any sense I would expect the use of Swiss symbols to be strongly protected by both companies and that they secures some factors on them. The Wenger stamp used in the 1980s and 1990s may in many cases look completely the same but there are differences from all the factors I have mentioned. But for sure I would expect some small secrets on them for sure. Wenger does an excellent job on the precision of the stamp with the letters. The introduction of the backside W or “three knife logo” in the late 1980s is an evolution and a nice helping tool. I do believe Wenger got a few different methods in how the stamps are done on the blades. It is no point for use to learn any system on the stamps at all, all we need to know is that there are all factors involved and that you will for very sure find small variations. You will need to learn the stamps used by Wenger on the period you collect but to be able to distinguish similar looking stamps with production variation then it will be a different game. Much more difficult. It is helpful to be driven in the production variations because it will be a nightmare to fool you if an advanched fake should appear with success. For It is very normal with Wenger knives to have small differences. Until today i have never seen and fake Swiss Army Knife that is faked with any success. The problem with fakes are usually only similar looking products and the use of Swiss symbols. You will see momentarily how different they are and if you learn some evolution, history and get used to knives then you are safe. In a way the small production variations and differences can cause massive problems for a fake manufacturer because they will not understand them. If a deliberate factor is put into a knife and it should appear on a fake product then it would be a hint i would say.. I will explain some more about a deliberated factor. It is always the case on fake products that they miss some places no matter what. Usually a fake or a knockoff product is only similar looking and use Swiss Symbols but when in your hand it is no problem to see that it is a fake. Ok! Many would say that they have not used an original or Genuine product as the template for the knockoff products. Then why are some factors then on the fake product when it is not needed?? It is not possible for any modern production or manufacturer to have the complete same angle on grinding or polishing machines. It is not possible to have the same dimensions without something wrong. If somehow a factor put on a real SAK product should appear on a fake one then it is a bit strange. This can be normal production variations but also deliberate ones. It is not fair and it is not necessary. Sometimes a manufacturer copy the same functions in dimensions and put them into a body of a knife with far too wide space between the springs and liners, this is because it is difficult to have the same precision assembly and some production factors that can because the production is reverse. In many ways you can copy functions but all the small factors for precision like the Swiss use cannot be according and somehow all the evolution factors from the real deal backfire. It becomes a mess from left to right and hence the quality of the fake is not good. In a sense the evolution of a product and variations can cause big problems. The Swiss production is perfected and cannot be compared elsewhere. If some factors should somehow be put in deliberate and somehow this appears of a fake then? Sometimes I can see the mess on a fake product to be a kind of trap because the use of functions that is copied and put into an assembly that ruins the complete product. I have never seen any fake Wenger knife that has any resemblance to the Genuine product. Do not worry. I have seen Victorinox products that are semi-faked with some factors mentioned here. Only Victorinox knows their code. I would however mention that the copies are getting better but I have not yet seen any success. If you know evolution, history, stampings and the knives then you will turn on them with real knowledge. Victorinox and Wenger don’t copy each other because they have been rivals and competitors. Only Victorinox and Wenger knives are real. So far it seems the problem with fakes and knockoffs has caused Victorinox the most trouble, it is a shame. 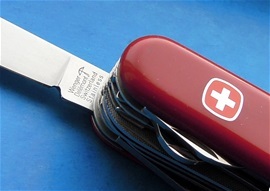 The problem with fakes and knockoffs is that they consider themselves competitors with Victorinox and Wenger. Today it is only one Brand Victorinox. 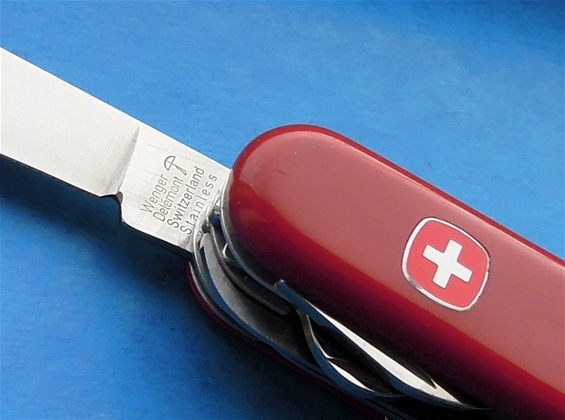 Victorinox have had massive trouble because of the foreign makers. It is not correct when a foreign manufacturer first copy a knife and then try to sell this for a low cost. Also tries to be competitive with advertising knives and different markets. It damages the original or genuine products.